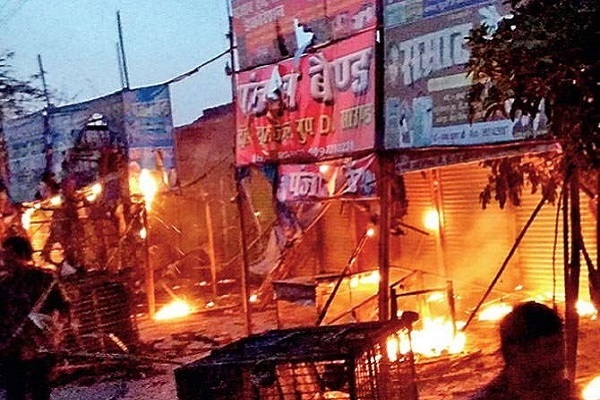 Nawada: Bihar, 'Ram Navami Violence. Nawada: A huge procession was taken out on March 28 (Rama Navami was on March 25) in a local market. People from neighboring villages were called to join the rally. However, it passed peacefully. On March 30, a Hanuman idol placed on a disputed land was found broken. People gathered and attacked a nearby marriage hall where people attending a marriage ceremony were staying. The crowd set a motor cycle on fire and damaged a shop of sanitary fittings. The police have arrested around 10 people out of the 40 named (20 each from both sides) accused, including few who were staying in the marriage hall. Eyewitnesses have revealed the involvement of the local leaders from BJP.